What to do with all of those plastic water bottles? Make water bottle vases. You could drop them in the recycle bin but that’s no fun. I like the vase idea. Some people might thing the vases are trashy but hey, cheap decor. 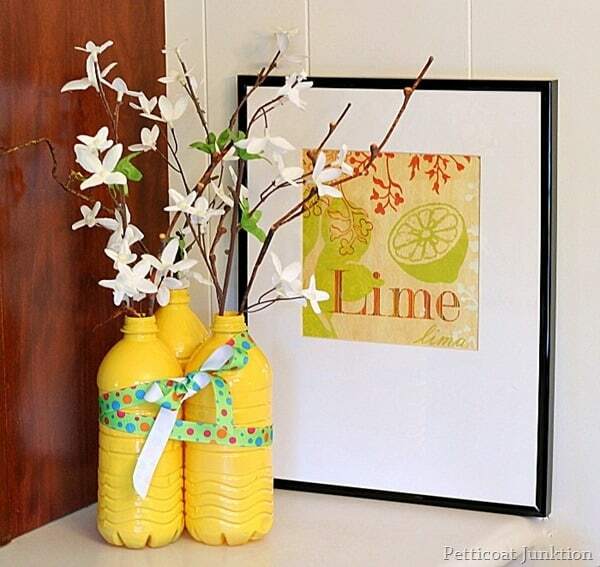 The water bottle vases would be perfect for a wedding reception. Why spend a bunch of money on something you will use for a few hours? I usually drink bottled water and the hubby drinks water out of the tap. Instead of bagging these up for recycling I decided to spray paint them. Spray paint is my friend. I removed the labels but not the part where the labels are glued to the bottle. See the little white pieces. I’m kind-of lazy. Have I mentioned that before. 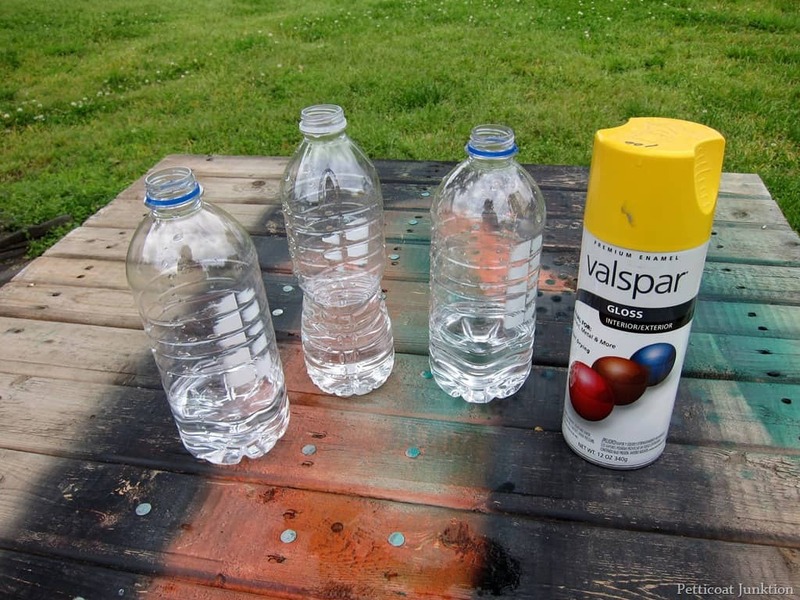 This is just a quick fun project and I didn’t see any need in spending half the day removing glue from plastic bottles. One tip….fill the bottles half way up with water so they don’t tip over while you’re spray painting them. They’re pretty lightweight when empty. I spray painted over everything and the paper didn’t show. But the black stamped-on date shows through the paint. It’s a good thing the date is small. I don’t know how many coats of paint it would take to hide the date…..but I’m telling you….it would take a lot. 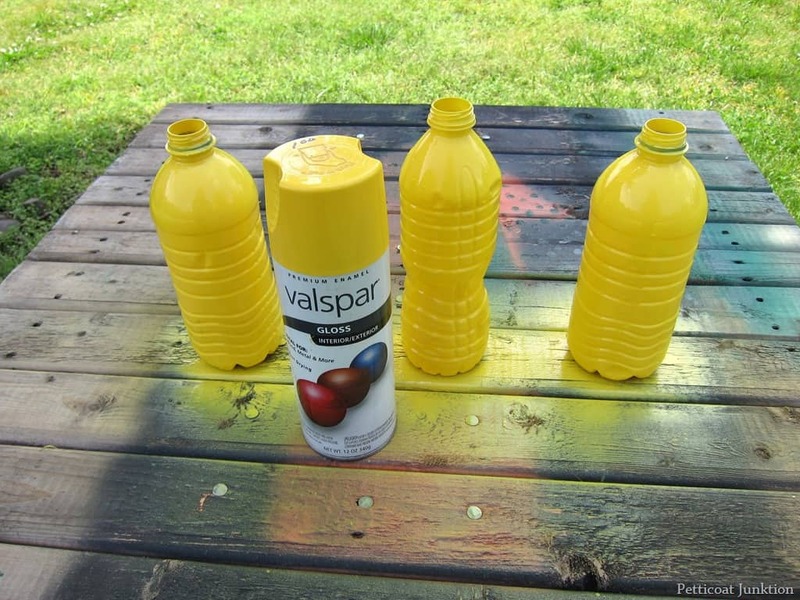 The Valspar spray paint cost me $1 at Habitat Restore. It was a full can too. I added artificial flower branches. The Spring flowers in my yard are looking a little puny right now. And I photographed the bottles all nicely lined up in a row but I didn’t like the way they looked so I grabbed a roll of grosgrain ribbon. I circled the bottles with the ribbon and then did a little angled thing with them and finished it off with a bow. You guys know I like to do the unexpected. Always group decor in odd numbers. 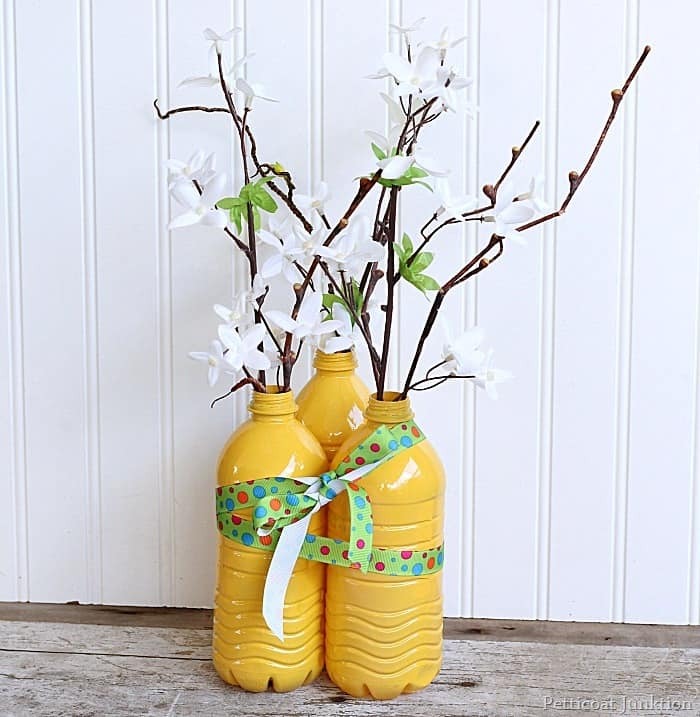 This project started with bottles headed to the recycling bin, a $1 can of spray paint(with spray paint left over), ribbon I had on hand, and a few artificial flower branches. I estimate the cost of this project to be….$1….maybe less! View my video on how to paint home decor in batches here…. If you like this project check out the glass jars I spray painted white….they are classy. I think these would be great for a birthday party or BBQ. As a former art teacher, I have tried to find uses for just about anything that would be thrown out. Kids could also help paint them. Cans are also great for making impromptu vases. In fact, I had friends over for dinner and at the last minute decided I would use the tomato, sauce, and paste cans (labels intact) filled with flowers and herbs from my garden for the table. They looked great with our Italian meal and my guests thought it was cute. I say it’s art and just go with your whim! This just shows how a creative person can make something from nothing. Suppose someone is reading this blog that doesn’t have a lot of money? Well, the can add some color to their home for a dollar. I agree this is not a formal project, but it is a cute and creative project. Add some rock/marbles from the dollar store and these would look great on a patio or deck area and would not blow away and for a dollar, one could change the color at will.Love your creative thinking. You’re so right Clearissa. Thanks! Just an fyi, you can usually remove that black date with rubbing alcohol. They’re cute. 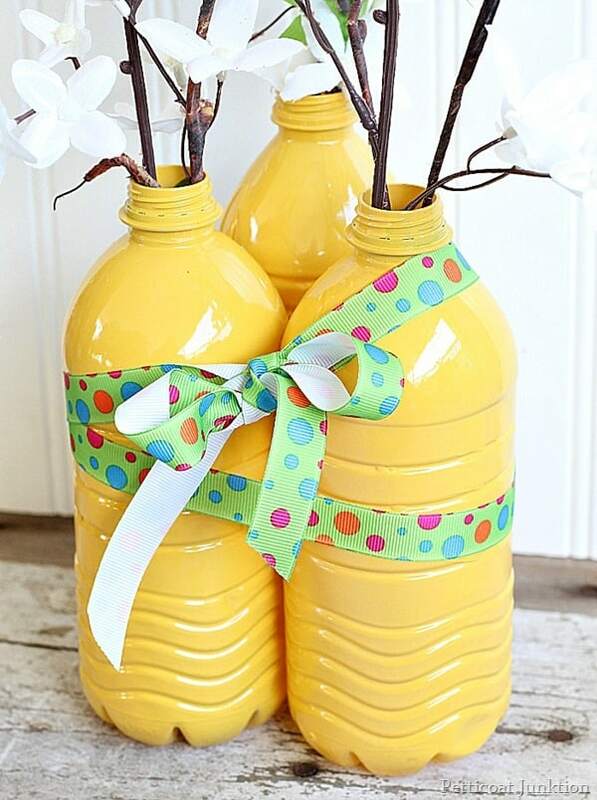 I take 2L bottles, cut the top off, wrap in tissue or colored cello wrap, rubberband it & cover with rubberband with ribbon & fill with flowers to take out to the cemetery. I usually put a few rocks in the bottom to keep it from falling over. It works great because they’re unbreakable and safe with cement and metal tiles as markers all around the area. Hey Michele, Thanks for the tips and new ideas! Way to go. 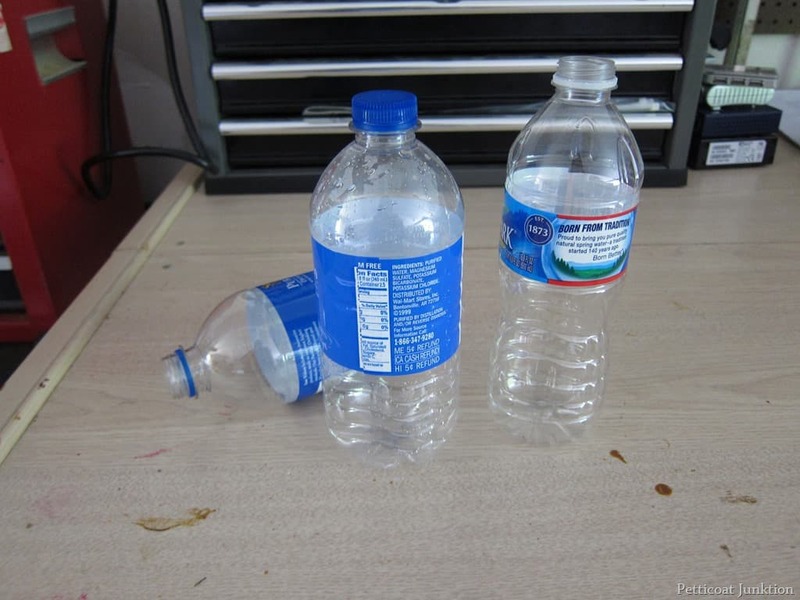 You’ve coated perfectly recylable bottles with a toxic substance. I say neither trashy nor classy. They’re really cute! I love that bright yellow color especially paired with the framed citrus print…perfect! LOVE THESE….GREAT FOR USE ON PATIO/DECK OR INSIDE…LOVE COASTAL DECOR, DEF CAN TRANSFORM FOR THIS…JUST ABSOLUTELY VERSITAL!!!! Would be super cute for a picnic or deck/patio. One man’s trash, etc. I couldn’t have said it better Alicia. Thanks! I think they are adorable. while they may not be everyone’s cup of tea that’s ok. But one thing I have learned as an adult is that just because someone doesn’t like something doesn’t mean I shouldn’t. If I like something, that’s enough for me! 🙂 These are so cheap to make that you can change them out as often as you like without being out a lot of money…so create what you like and if someone doesn’t like it….well, so what?! Let your creative juices flow…. Kathy, I am new here but I find so many blogs have some pretty RUDE individuals that apparently didn’t learn any manners as children, women are the worst. I am sorry about that. Your creative juice were flowing and three cheer to you, they are adorable and if anybody had half a brain they would realize you wouldn’t use then on your table for a formal dinner party. GEESH, if ya can’t say something nice, STFU…… OOPS did Grammie just say that… You bet. Linda, Thanks so much for having my back…these negative comments don’t bother me…really. And I did ask if they were trashy or classy!! Thanks for your comment! These are too cool, Kathy! Such a fun idea! 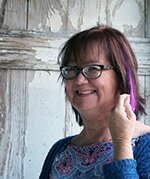 Great thrifty idea Kathy…love the color you went with. I think there very pretty! Love the bright color, very cheerful. Your choice of flower branches go perfectly. 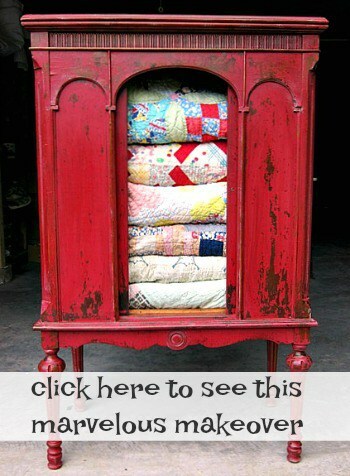 Great idea for repurposing, but I can think of a lot of other ideas for the paint. 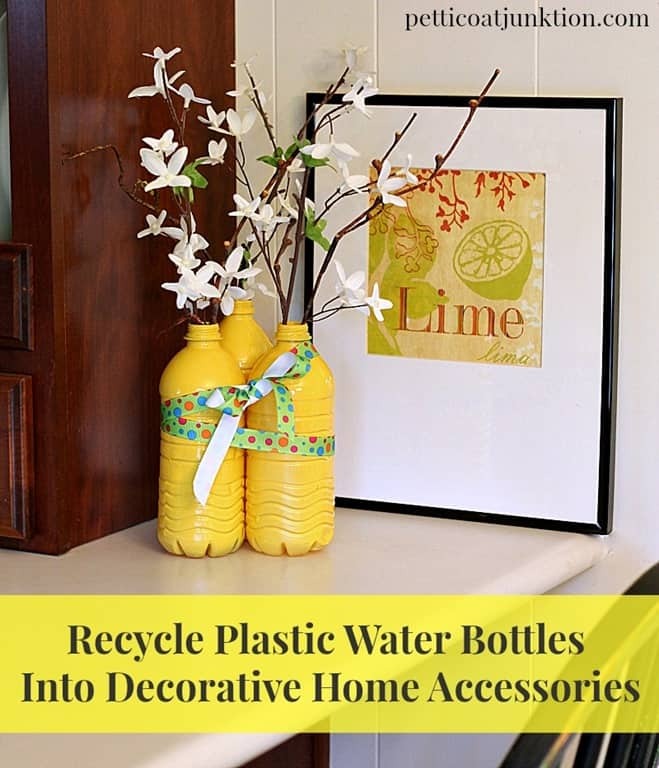 When I have a cupboard full of beautiful vases, why would I spend time decorating something that is reuseable and can be recycled? Way to think out of the box Kathy-that’s why you’re my fav! I know it’s not everyone’s cup of tea. Thanks for the comment Cheryl. I think they are just too cute!